This afternoon, as I walked Phoebe down our road to a neighbor’s house for a playdate, a strange plant caught my eye on the roadside. 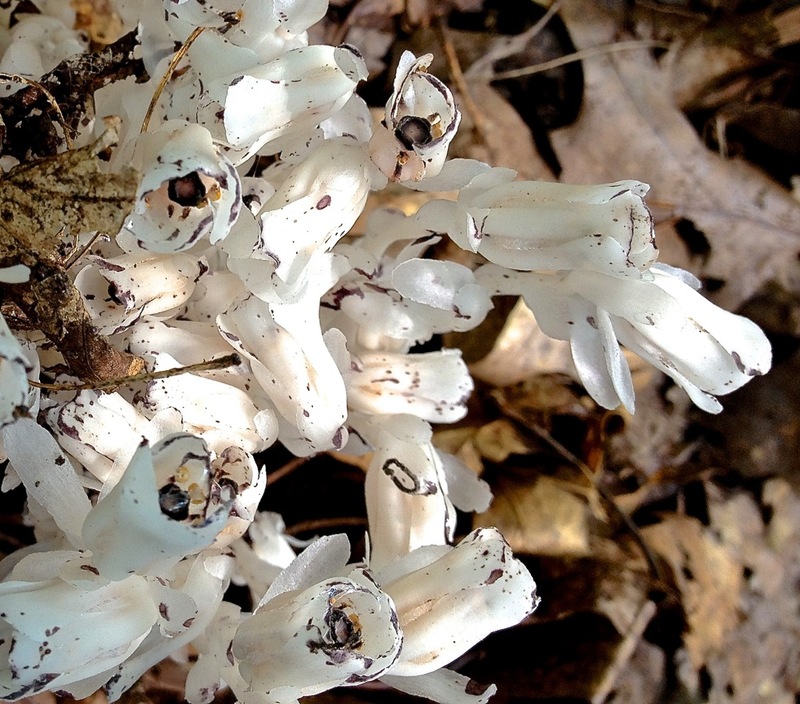 Emerging from the brown fallen leaves were some bundles of waxy-looking stalks with what looked like bell-shaped flowers on top. They were almost totally white. I don’t just mean that the flowers were white. The whole plant was white: stems, leaves and flowers. All white. I bent down to take a few photos with my trusty iPhone. After chatting with my neighbor about school supply lists and other exciting news, I completely forgot about the weird plant. This evening, I remembered. 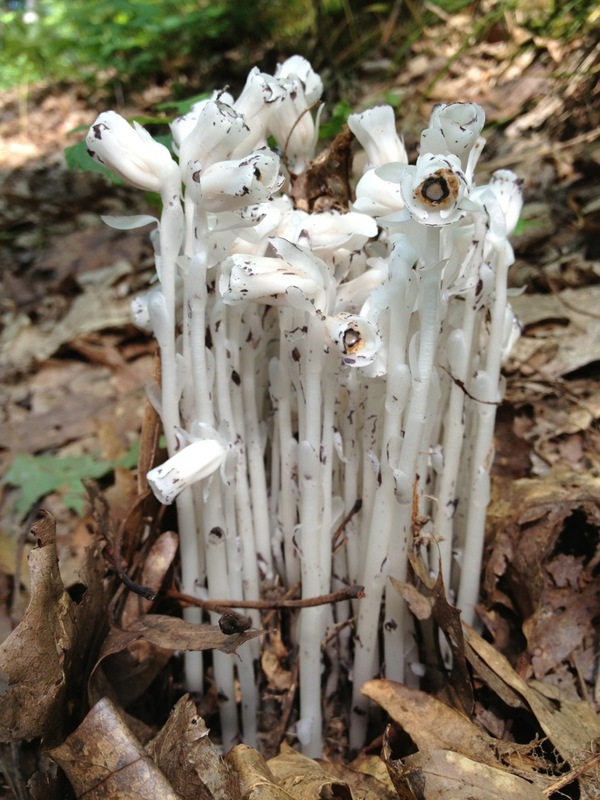 A quick google search (for “white plant”) led me to the identification of the Monotropa uniflora, also known as Indian Pipe (they do look sort of pipe-like), ghost plant (they definitely look on the ghostly side) as well as corpse plant. Anyhow, this post is (mostly) not about that corpse flower, but the less famous, and much less smelly flowering corpse plant. While not nearly as dramatic, it is still a bit of a botanical oddity. This plant, you see, has no chlorophyll. 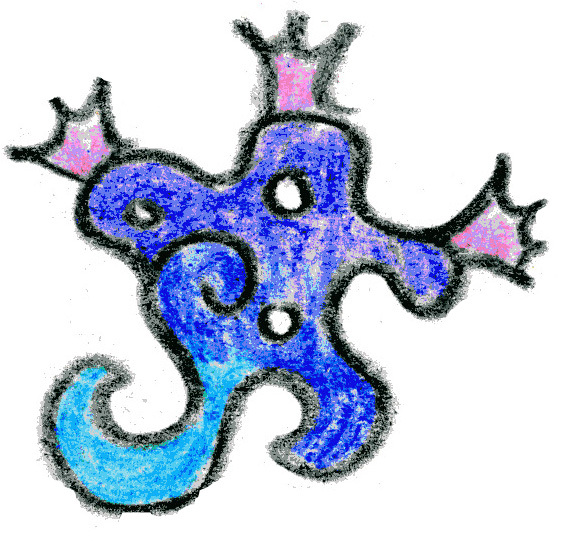 As such, it is not able to produce its own food, but must live off of other plants. Specifically, it lives off certain trees and fungi. Unlike many fungi, which give something back to the host trees on which they live, the corpse plant only takes. It is parasitic. And I’m thinking kind of vampiric. I hope to go back another day with my real camera to get some clearer shots, but I don’t know how long these things bloom. Apparently they will dry out and turn black fairly soon. I find it remarkable that I had never seen them before, nor heard of them. From what I can tell, they are fairly rare. I suppose that it caught my eye due to my recently heightened roadside plant awareness–we are always keeping our eyes open to avoid stepping in a tangle of poison ivy (which is lush and green and sadly, not rare at all). Once upon a time there was a young graduate student, or if not young, at least one who as yet had no gray hairs on her head, who embarked on her journey towards the degree of Doctorate of Philosophy with great optimism and arrogance. She was confident that she would not be one of those for whom large numbers of harvests would pass before reaping the Golden Fruits of Doctorhood. Her hubris angered the gods of Mount Academia, who saw fit to place a curse that the student would forever make progress, forever see the end in sight, but forever get distracted by Other Things, until such day as her hair turned gray and her University turned her out. Back when I started my PhD program, I imagined that I’d work through my various pre-dissertation requirements in a timely way. I mean, everyone knows it’s hard to finish a dissertation, right? But the other stuff, well that’s not such a big deal. I was already ahead in terms of course requirements, and in having completed my Master’s, had a head start on some other major requirements. Practically a Mere Technicality, the Book Review was to be something on a par with a course project. All you had to do was pick a relatively recent linguistics book, read it, and write a 12 to 15 page review. Officially, according to the program requirements, it should be completed in the first year of PhD studies. (Not that most do.) Having received my Master’s in the fall of 2004, that was when I officially started the PhD program. I was on a reasonably reasonable schedule, picking my review book in that first year or so. I set to reading it. Slowly. Very, very slowly I read it. At some point, I lost it. Then found it. Probably realized I didn’t remember what I’d read. Started to reread it. Come 2006 I had read the book, but hadn’t yet written anything, when I experienced what might be considered a distraction from my studies. At some point later, John (my husband) tried to talk me into getting a Kindle. As a selling point, he told me about some books he found that were available. “They even have that one you keep falling asleep reading.” Yeah, that would be the Damned Book Review book. A couple of years and another distraction later, my advisor and I agreed that I should pick a new book for the Damned Book Review. We picked a newly released updated edition by a noted person in my field. I plowed in diligently, being sure to take careful notes this time as I went. I was Determined. But then I realized along the way that reviewing a new edition should involve comparing it to the old one, which I had read before, but years earlier. I’d have to go through it again. The task went slowly. I got demoralized, thinking that I wasn’t really a great person to review the book. I mean, I had met with and corresponded with the author, who, as I said, was a quite well known person in my field. Who was I to criticize? Come late 2010, I switched once more to a more recent book, this time by an author I’d never met! Who worked in my field, but a different analytic tradition! Yeah, I could critique that. I dug in. But I don’t know, other things came up along the way that were a higher priority. I’d read a chapter or 2, and then get caught up in some new wave of work deadlines or family crisis. Back in April or so I was provoked to make a new push to get through some more of my requirements, including the Damned Book Review. (Remind me to tell you about the Form of Shame.) I finished reading and had amassed 40 pages of notes. I was getting so freakin’ close. But not quite close enough. 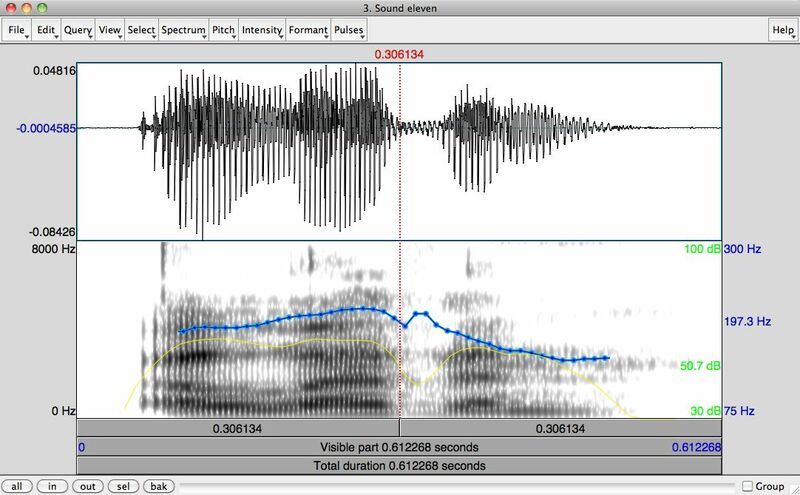 I had to switch gears to get ready for my trip to China and my presentation there. Next thing you know another couple of months and several new crunches and deadlines have passed before I got myself back to the Damned Book Review. Last week, suddenly free of other pressing deadlines, I dug back in. And you know what? 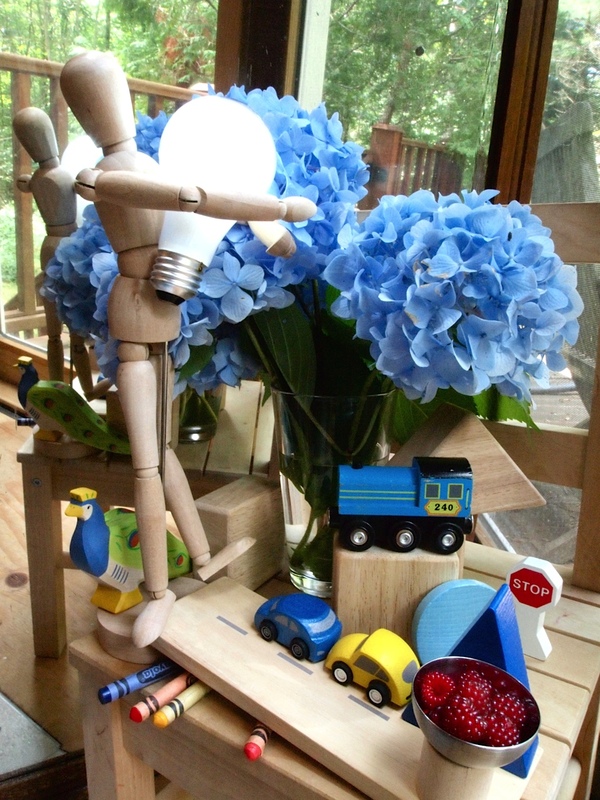 Today, while sitting in my in-laws’ basement and keeping Theo company while he rode a vintage tricycle around in circles and played with a pile of vintage matchbox cars, I reached a point that could be considered…good enough to send a draft to my advisor. So, maybe not done. But 3 books and 8 years later, damn if it isn’t doner than it’s ever been. Happily, the title of my previous post provided, because I came across this photo from a January trip to the Boston Museum of Science. 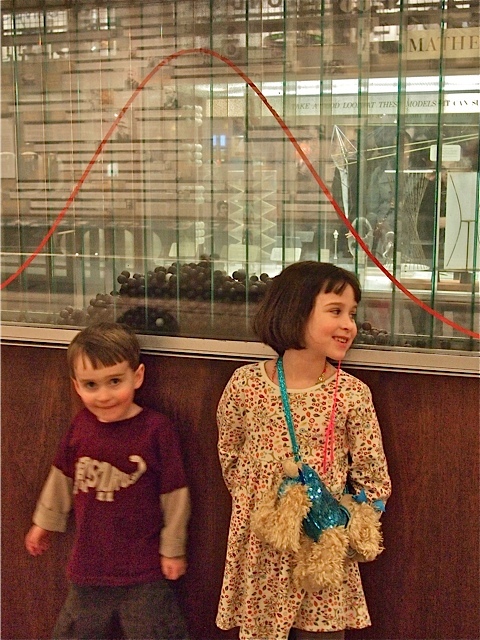 Here are Phoebe and Theo, standing in front of a display demonstrating normal distribution.² (I learned tonight that this type of set-up is called a bean machine, which is a cool thing to be called. Not that I’m saying I want to be called a bean machine.) Anyhow, I couldn’t refrain from making “normal” jokes. I asked Phoebe and Theo to try to look normal as they posed in front of the normal curve. My two children, acting normal in front of the normal distribution. 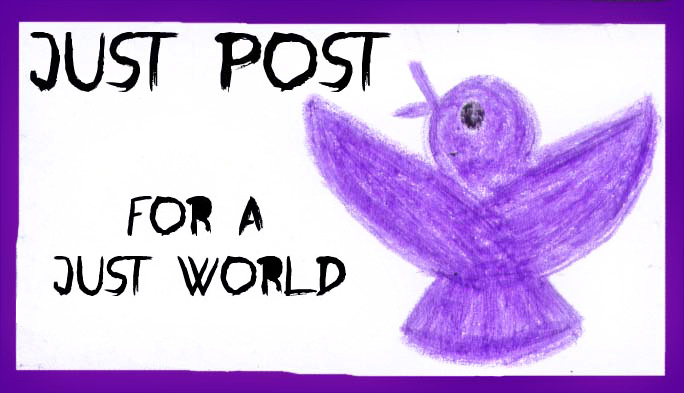 ¹ I can spend far more time thinking about posting than actually posting. ² I realized that this is a lovely spontaneous usage of a sentence with attachment ambiguity.³ One could read this as “Phoebe and Theo demonstrating normal distribution, in front of a display” which would be high attachment. In case it wasn’t clear, I intended the low attachment reading, with the display doing the demonstrating. If Phoebe and Theo were to try to demonstrate a distribution in front of a display, I expect they’d have an easier time trying to do something bimodal. ³ It’s totally normal to reflect on attachment ambiguities. It’s 11:11 on 11/11/11. Here are 11 elevens. I think this will be one of my favorite t-shirts, and there’s a good chance I will have to order some more Karen Hallion creations. Phoebe may just have to have the Streetfighter Hello Kitty, and Theo may well need the Droid Army Where’s Waldo one. Perhaps John will need one of the various Firefly ones (especially one that features Calvin & Hobbes. Shiny.) 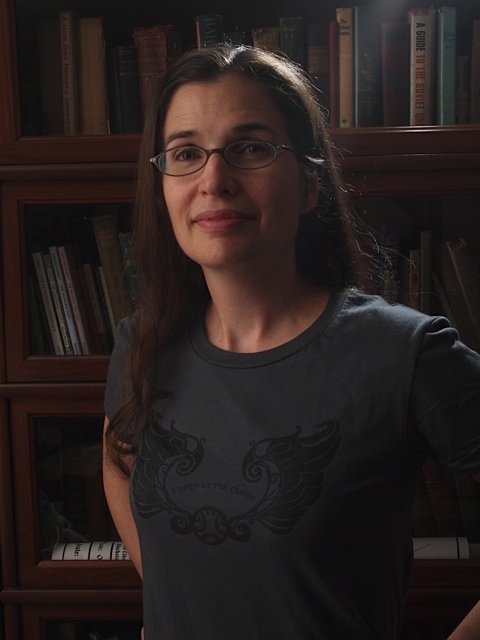 If you appreciate some geekery on your t-shirtage, you should totally check out her work. 364:365 A ridiculous still life, with everything but the kitchen sink. Unbelievably, I have just about made it through Project 365. 364 days in, I have managed to take (at least) a photo a day to share online. Admittedly, there were 2 or 3 times when I didn’t quite manage to take a photo before midnight, plus some other times when time zone mismatches made it look like I’d missed a day, but I always remembered to take some sort of photo by the time I went to bed. In this year of chaos and of feeling stuck, this project has felt like an accomplishment. 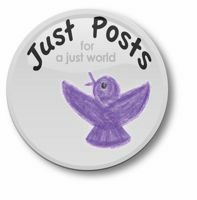 If you don’t want to play or leave a comment, click here. Pi Day caught me a bit off guard this year, but was not going to let my unpreparedness result in pielessness. I had some errands to run this afternoon, so I stopped by the store while I was out to get a pie crust and some frozen berries, and voila! The Pi Day Pie tradition has been upheld. This pi pie is the 3rd such pie I have under my belt. (Not to say that I ate three whole pies today. Though I could imagine such a feat. I do love me some pie.) My Pi Day tradition started with a pi post back in 2008, which then inspired me to bake my first pi pie. Pi Day of 2009 was a pieless day, due to traveling and attending a wedding, but then I did recapture the pi magic in 2010. 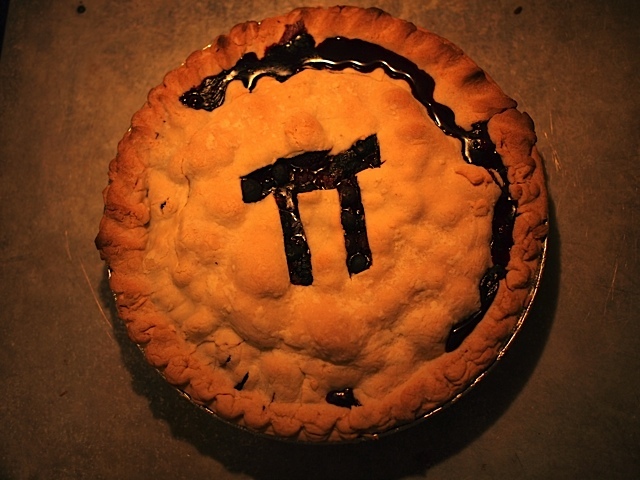 In celebration of Pi Day, I offer you a gallery of pi pies past and present. My original pi pie, from 2008. I was so fond of it, I even wrote its obituary. 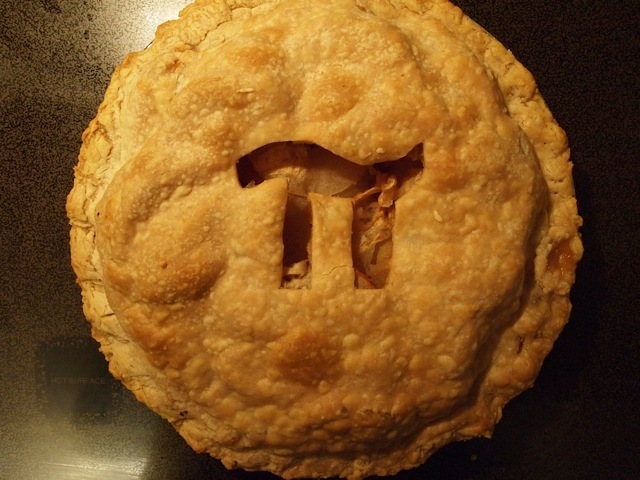 Last year’s pi pie was an apple pi. This year’s pi Pie is of mixed berry heritage.